"Your Chocolate Walnut Coffee Cake was fantastic! Not too sweet but very chocolatey. It was perfect with my coffee. Now that it is gone, I'll have to order more!" -- - T. Dickson, Portland, Oregon. This is a cake lovers dream! Excellent value - any three Signature Coffee Cakes for the price of two! CoffeeCakes.com Chocolate Walnut Coffee Cake is a traditional chocolate sour cream coffeecake with lots of pure dark chocolate morsels and fresh whole walnuts. Serve it plain or with your favorite ice cream. The CoffeeCakes.com Chocolate Walnut Coffee Cake is trans fat free and does not contain any artificial coloring, artificial flavoring or preservatives! 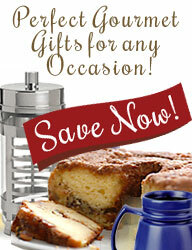 Makes a great gift for giving and entertaining! The one-pound twelve-ounce coffee cake serves approximately 10 - 12 and can be frozen up to four months. Chocolate Lovers be sure to check out Chocolate Time.